I’m familiar with the glance of trepidation shared by the older couple as we slide into the pew ahead of them in church. They see a single dad with two young girls. They’re probably resigning themselves to a service done in by distractions, rudeness, and electronic gadgets. By the end of the service, though, it’s usually a different story. By this time, they’ll have seen the girls sitting quietly, singing the hymns, and joining in the prayers, nary an iPhone to be seen. I used to thank them and say, “Well, my wife is a priest…” but I came to realize that something odd would happen at that point. The smile would become fixed, the eyes would glaze over, and they wouldn’t listen to a single further word that that I said. I couldn’t understand it. Why this response, especially when they are asking me how it had been accomplished? Then one day it hit me like a ton of bricks. They think that my kids came this way. As if there’s some mitochondrial switch inherited from my wife that makes the girls perfect little angels in church! Lemme just say: this is most certainly not the case… No—what you’re seeing here is not some kind of genetic accident. This is years of hard work. This has been a joint effort; my wife and I have worked together on this, teaching and shaping them, but due to her Sunday morning commitments much of the pew-time activity has been directed by me backed by an arsenal of hissed directions, subtle and not-so-subtle cues, and withering death-stares. If there were such a thing, I totally would have unlocked the achievement “Pew Whisperer”! I don’t mention my wife’s job anymore, because in one sense it’s not relevant. My kids don’t behave because their mom’s a priest. They wouldn’t have the option to behave any other way no matter what she did. Worship is important to how we as a family understand the Christian faith and how we live it out. In fact, I think folks have it backward: it’s not that we value worship because she’s a priest—rather, she’s a priest (in part) because we value worship. How we raise our kids is just another aspect of how we feel about worship. The more important point, though, is practice. What’s the best way to learn how to behave in worship? It’s to be in worship. Sure—there’s more to it than that. 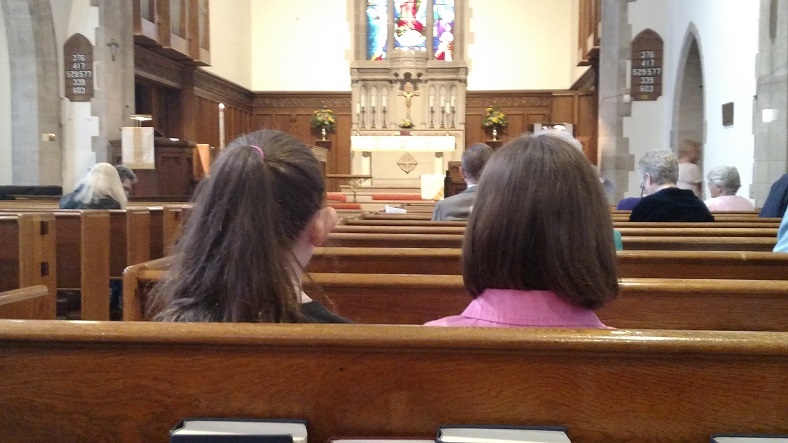 I have a whole trove of the secrets of a pew whisperer that I’ve employed over the years to raise engaged children who look forward to going to worship (most of the time…). But the heart of it is the practice: being there. And that’s something anyone can do. We care about how our children believe, and the way that they inhabit, engage, and ultimately own a place in the worshiping community is an essential part of that. In our baptismal vows, we promise to share the Good News with others; as parents, our primary mission field is our own kids. For us it all begins in worship. It begins with raising our girls into their baptismal identity as people who praise—giving them tools to claim their place within the worshiping people of God. What “secrets of a pew whisperer” would you like to know? What secrets can you share? I also believe that the only way for children to learn to behave in church is first of all to be there. Also, they will learn to be quiet and participate if others are good examples for them. We used to sit in a pew next to the cry room with our 4 kids…the threat of taking the kids in there was enough to keep them quiet. So was making them always sit in the front row!! But, the real key to any good habit is practice. This is why I’ve never liked the very common practice of having the kids in Church School at the same time as the Sunday service. Lutheran churches tend to do it right by having an education hour for all, and all can then be in the worship service before or after that education hour. But I realize this change is hard, as I’ve been in a parish (Episcopal) that tried to move to a two-event experience for all on Sundays (education plus worship). It seems it was too disruptive for too many. Everyone together in church (Episcopal) until the hymn that precedes the sermon…kids leave for Sunday school…then before communion they return. Shortens the Christian formation time…but our younger parents seem to prefer this rather than the full 2 hours in church. We’ve tried it both ways . Thank you for the article. In our family its the other way around. I’m the pastor and my wife has our 2yr old daughter with another baby on the way. My daughter knows we go to church but is learning about worship. All she knows right now is that “daddy” is up front and wants to help out. How wonderful is that! But, some have said this is not right for children to be up and moving. When did worship become so stuffy or a certain way? It can be very difficult for children to be in worship and asked to sit like adults (actually the adults get fidgety too.) One of the things I try to do is to get the children to participate and moving. As an example I invite the children to come up for the prayers of intercession. I invite them to hold me hands as we pray together. There’s no perfect worship and I think sometimes peoples expectations of how children and adults are to act can be ridiculous, even more the “pastor’s” kids. My hope is that people will experience worship in a way that encompasses the Triune God, many generations and ages, where we can be in one place and sent out into a world where we can show that love to all the world without expecting certain behavior. When I was a wee lad I didn’t exactly have to “follow the whole service;” I could read the kids bulletin or draw, but I had to stand when the congregation stood, sit when they sat, kneel when they knealt, and sing when we sang the hymns and service music. As I got older, requirements increased, along with acolyting, etc. It seems to have worked well enough, since I wound up going into the priesthood. Love this – and agree that being there is the FIRST step. I’d love to see a series on this, with your and others’ most helpful takes on what constituents the second and third (or more) steps. One thing that’s been especially helpful for me is to know that a) not everything that worked for other families will work for mine, so I need to experiment and find our own ‘best practices’ and b) not everything that works this year will work next, as kids go through stages. I suppose the kid-stages part is obvious on some levels, but it can be hard to adjust my expectations during the transition times! Good news – Derek says he DOES have a series for us. I am looking forward to it also! My own experience has taught me that when my kid (4yo) is wiggly and chatty it’s more stress on me than anyone in the pews around us… they are generally glad to have kids there! Keeping that in mind lessens the anxiety. My girls also were quite well behaved when their mother was leading worship. But then puberty came along. They assumed a surly posture in the pew, looked for excuses to skip church (especially if their mother was not preaching), and then became critical of the liturgy and the music. But I remember fondly those days when I worshipped with a little angel on either side. Good luck with high school, Derek! I’ve just happened on this lovely site. Is it possible to have suggestions for a grandmother? My youngest grandchild is 4 months! I’d love to share my faith with her through our time together. Are there books or are there any grandparents in the Forward family who could share their stories with me? Thank you! Thanks for commenting! There are some posts you might enjoy listed on our archives page: http://www.growchristians.org/archives/ – see especially the posts about grandparenting. It’s a small section but we intend to expand it. 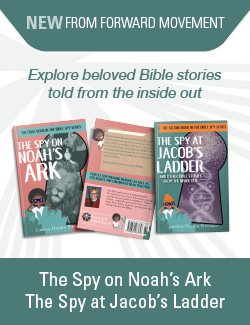 You might also like this post about children’s books and lessons of faith: http://www.growchristians.org/2016/09/08/reading-together-can-plant-seeds-of-faith/. Finally, check out Storypath (http://storypath.upsem.edu/) for ideas for children’s books tied to the liturgical year.